New Game 'The Naughty List' NOW LIVE! 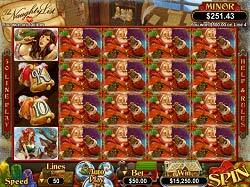 Have you been a naughty or a nice slot player this year? Will Santa fill your Christmas stocking with Free Spins? Or would you prefer a progressive jackpot prize under the tree? It truly doesn't matter if your spins have been with good or evil intentions as our newest slot machine Naughty List will always pay up. This Christmas-themed online slot will keep you jolly past the holiday season with bonus features, progressive jackpots, free spins and much more. Enjoy winning possibilities in all 5 reels and 50 paylines and a chance of even more Christmas fun with two randomly awarded progressive jackpots. In addition, two individual free spins bonus features will help you fill your stocking with even more coins. For as little as 0.01 you can spend this festive season spinning the reels, which are packed with Christmas related symbols such as the wild Santa. The wild will substitute for any other symbol expect for the Naughty List scatter. When landing 3 of these anywhere on the reels you'll get to trigger the Free Spins round. During the Free Spin Bonus round feature you will pick off other Christmas symbols from the screen in hopes of locating the positions that give you larger multiplier prizes. Once the bonus round is over the prizes will be added to your account. Naughty List offers you a chance to win more with a second Free Spins bonus Lucky Trigger feature that gives you 10 jolly free spins with multipliers as high as x10. Santa Claus has come to town earlier that usual this year with 'The Naughty List Slot'. Enjoy plenty of betting options, fantastic graphic and sound effects and many chances of winning!